This is an Innova Luca High Gloss Graphite Handleless kitchen solution. Manufactured with a 22mm MDF door and finished with a high gloss polyurethane lacquer. The Luca high gloss range is currently available in White, Alabaster, Dove Grey, Sky Blue, Sage, Cashmere & Graphite. With its clean lines and smooth appearance, this kitchen will bring a touch of class to any home. The process of finishing a true gloss kitchen door involves applying a high build polyester primer to the surface, sanding it, then applying a gloss polyurethane lacquer. Finally, some more sanding is required then buffing & polishing with compounds and waxes to achieve that glossy finish. Just to let you know how thrilled we are with our Luca Gloss Graphite kitchen. I've seen a lot of customer kitchens on Twitter so I thought I'd send a couple of photos of ours that you're welcome to use if you like. My completed kitchen fitted by "Andrew Hall Joinery" from Sheffield. Please find attached a selection of photographs from our fitted kitchen. Excellent service and quality. Heard about you from my son. Couldn't have been more hassle free! Kitchen was extremely easy to order. Even when I wanted a carcass and doors slightly different to the website it was catered for. Pictures speak for themselves, impeccable quality. Personal Dashboard for any information/enquiries regarding your order is extremely helpful. Couldn't have asked for a better service. The table is actually hand made from scaffold boards planed and waxed!.. same as the bench underneath the table and the bookcase. The pew is church original and was 20ft which we had taken down to 9 1/2ft with the table being 8ft long. We recently converted an old stable block into a three bedroom house and wanted a modern look to go with the rest of the decor of the building. We visited your showroom and decided on the Luca Gloss range in Graphite with an island in Dove Grey. It is very hard to photograph as I can't get far enough away to get the whole kitchen in the shot. We are delighted with the result. The pictures do not do it justice, it has the real "wow" factor. My husband and son fitted it, with no problems. This is the fourth kitchen we have purchased from you over the years and all have been excellent quality and build and all for a lot less money than you would expect for such a quality kitchen. Due to the size of the island, we had to go for a Granite work top, but feel that the unusual marbling effect works well. Our rescue dogs Luke and Merlin, are continually staring at their reflections in the dark shiny surface, which despite my fears, is proving to be easy to keep clean and free of fingerprints. I have added a few pics of my finished Luca gloss kitchen. I'm so in love with how the kitchen/dining/living area turned out. It was a lot of work making 3 rooms into one space but it was worth it. I get a lot of friends' comments when they see it or when I post pictures on social media. I have recommended you to a least 20 people, including my mum who has since ordered from you. Pictures of our completed Luca Gloss Graphite kitchen. I would just like to say how much I love my kitchen. I have attached photos of it. As a carpenter I often fit kitchens. One of my clients purchased one from you and I was that impressed that we put one in my own new extension, and have sinced purchased another from you for our utility room. Please find attached images of our finished kitchen. Your support has been faultless. Very pleased with the quality, price and delivery from DIY-Kitchens and we wouldn't hesitate in recommending them to others. We were recommended by a friend. Great quality and excellent value for money. We are thrilled with our kitchen - didn't expect it to look like it does. Thanks for your help with ordering, delivery & replacement parts. We are very happy with the finished kitchen. This is the second kitchen that I have installed. On both my properties these kitchens has transformed the space. Good value for money. I have used DIY kitchens after I found them on a google search. I have recommended them to plenty contractors as I do interior design projects. We are very pleased with the kitchen and has exceeded expectation, we did wonder if it was going to be too dark, a frend thought it was a show kitchen when he saw photos. I installed myself as I am a keen DIYer and this is my 3rd kitchen in > 30 years, the previous two were MFI and must say this was far easier. My son recently had a similar kitchen from Howdens and I think this is superior. Pictures of the completed kitchen. 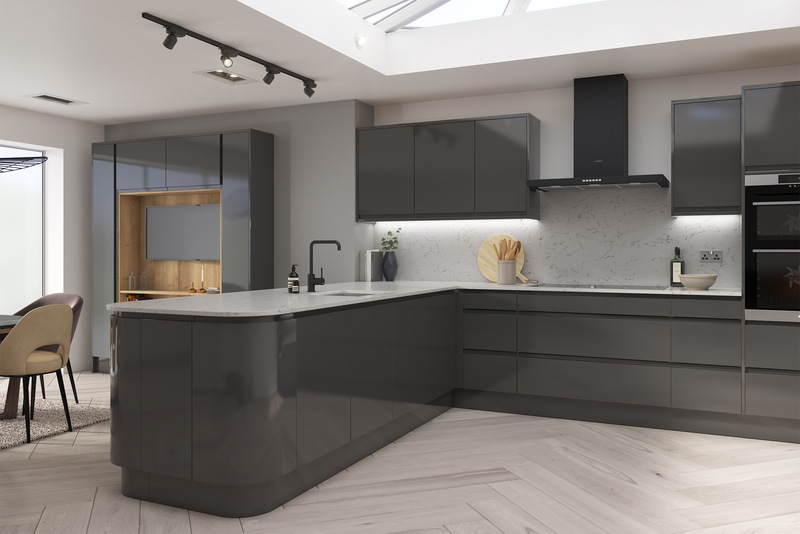 We are really happy with our new Luca Gloss Graphite kitchen, we had a good look round and couldn’t find anything better for a similar price. We went for a quartz worktop from a local supplier. Heard about you from online searches but also found out later some friends had their kitchen from you a couple of years ago and they were still pleased with it. We decided to visit the showroom, it’s a couple of hours away, but sold it as a road trip to the kids and bribed them with a trip to a zoo on the way back. We were glad we went, as decided to go for a darker colour than we had originally chosen once we had seem them in situ. There were some doors missing from the delivery which took a while to sort out but you did everything you could to get them to us ASAP in the end. It was useful to be able to have some units customised to suit, and everyone I have dealt with have been really helpful including the delivery guys. Our Luca gloss graphite kitchen is all finished! I have attached some pics of before, during and after our kitchen refit. Unfortunately I haven't quite finished, as work and other projects keep distracting me. Really happy with the quality and the service you provided, we recommend you to anyone who asks about our new kitchen. Love my kitchen, really good quality at very good prices. 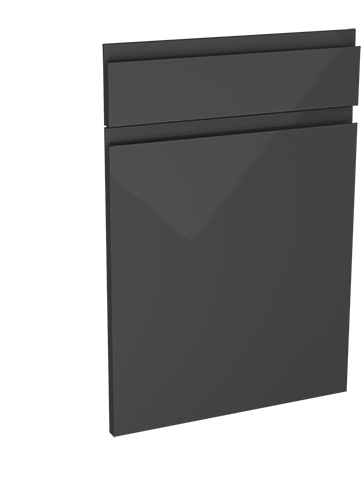 Order a Luca Gloss Graphite door sample pack Pack contains x 1 355mm x 297mm 'Luca Gloss Graphite' door. Fully refundable when placing a full kitchen order. There's no risk to you, we'll collect and refund the samples once you have finished with them.